You hook a jumpbox up like you would jumper cables, but it doesn't require a second car. If you've ever tried to start your car, and heard nothing but a faint click, then you're probably familiar with the headache involved in scrambling to find jumper cables and someone who is willing to provide a jump start. Maybe you even called roadside assistance, and they showed up with a fancy little box that somehow managed to start your car. Devices that are capable of providing a jump start without a second vehicle are commonly called jump boxes or jump starters, and they're actually pretty affordable and very easy to use. They do have to be charged from time to time, but it's a pretty small investment of time and money when weighed against the nightmare of getting stuck in the middle of nowhere with a dead battery. There are a lot of different jump boxes out there, however, they all share a few common characteristics. At the core of every jump box is a sealed lead acid or gel pack battery, which is permanently connected to alligator clamp jumper cables. Since the battery is sealed, there is little chance of it spilling or leaking, even if you tip the unit over. The battery is also typically sealed inside a plastic housing, which further isolates it. The cranking amperage and reserve capacity differs from one jump box to another, so while some of them hardly have enough juice to start a golf cart, others are capable of starting big diesel engines, designed to start dozens of cars between charges, and operate in harsh weather conditions. Air compressor — easily air up your tires if you spring a leak. Emergency lights — light up the roadway if you have to jump start your car, change your tire, or perform any other emergency roadside work. Radios — provide some entertainment when camping or tailgating, or listen for important announcements during emergencies and natural disasters. 12 volt accessory receptacles — provide power for 12 volt devices like phone chargers. Inverter — provide power for virtually any electronic device, although using the inverter will reduce the ability of the jump box to provide a jump start until you charge it up again. While none of these features are strictly necessary, and you can purchase a cheap jump box that doesn't have any of these bells and whistles, most of these features can come in pretty handy on the road. In order to use a jump box safely, you need to follow the same basic procedure that you would for a normal jump start. If your vehicle has any special procedures, then you should follow them. Otherwise, you should connect the positive jump box cable to the positive battery connection and then connect the negative jump box cable to a good ground. Although you can connect the negative jump box cable to the negative battery terminal, it’s safer to use a ground somewhere on the engine or the chassis. Although the procedures are similar, using a jump box comes with an additional issue. Since the cables of most jump boxes tend to be fairly short, the jump box usually has to sit somewhere in the engine compartment. This poses a potential hazard, so it’s vital that you make sure the device isn’t anywhere near the radiator fan, any of the accessory belts or pulleys, or placed in such a way that it might dislodge any electrical connections or sensors. Jump boxes are designed primarily for jump starting, but they can be used for a lot of other things. Even the most basic units typically come with a built-in 12 volt accessory socket, which can be used to power any 12 volt device. That means you can use a jump box to charge your cell phone, power your laptop, or run anything else that you have a 12 volt power adapter for. They’re also good for tailgating, camping, and other activities, since they allow you to power your electronics without potentially draining your car battery. Jump boxes with features like tire compressors can also be used to air up your car tires, beach toys, and other inflatable items, provided you have the correct adapter. Of course, it’s always important to remember that a jump box will typically has a sealed lead acid battery at its core. So while they usually don’t leak, you shouldn’t just assume that yours never will. If you want to be especially safe, then choose a jump box that has a built-in gel or absorbed glass mat (AGM) battery. Since a jump box is basically just a sealed lead acid battery with built-in jumper cables, it’s technically possible to make your own. While buying a jump box is usually cheaper than building your own, there are some cases where you might want to have the extra battery on hand. 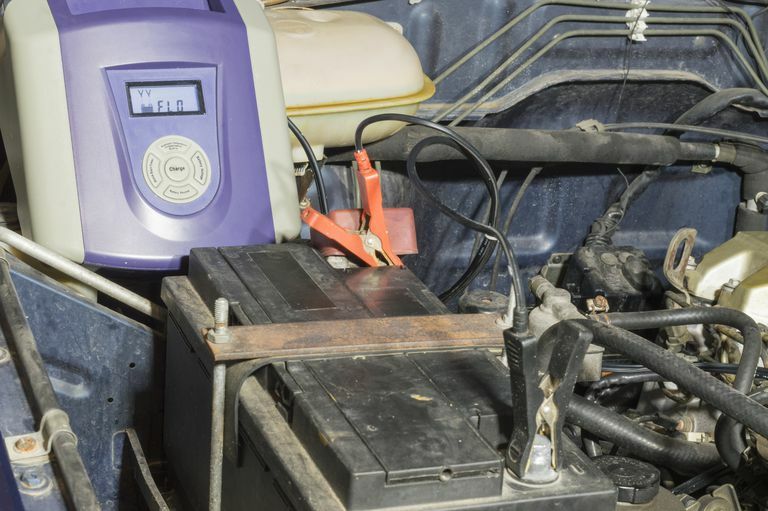 Some repair facilities make their own jump boxes by simply strapping several batteries to a hand truck, wiring them in parallel with heavy gauge cables, and then connecting a good pair of jumper cables. This is a great setup that provides a ton of reserve capacity, but it isn’t exactly portable. If you want to make your own jump box, the best, and safest, way is to obtain a sealed, maintenance free battery with high cranking amps (CA) and cold cranking amps (CCA) ratings, in addition to a battery box big enough to fit it inside. The battery box is an important part of the equation, due to the fact that although sealed lead acid batteries usually won’t leak if they tip over, they can, and often do, leak due to age, over charging, and other factors. The safest type of battery to use when building a jump box is a gel or AGM battery, but they are typically more expensive than sealed lead acid batteries. The last thing you’ll need to make your own DIY jump box is a set of jumper cables. You don’t have to permanently attach them to the battery box, and leaving them disconnected is actually a pretty good idea since it will reduce the likelihood of an accidental short circuit. Do Cigarette Lighter Jump Starters Work?